Today is the beginning of October Unprocessed, a month where I will eat only unprocessed food. It’s easier than it sounds, even living in the United States, where the grocery shelves are filled with an endless array of processed food products. I hope you’ll join me, if not for the whole month, then maybe for a week or two. Last year was the first year I participated in October Unprocessed, but it started unofficially in 2009 when Andrew Wilder and a group of his friends decided to try eating only unprocessed food for a month. He realized it made him feel better, reduced cravings for salty snacks, and, best of all, he could taste the foods he ate better. Then, in 2010, he started Eating Rules and the first official October Unprocessed began. What’s “unprocessed”? There isn’t really a hard and fast rule on it. Pretty much any cutting, slicing, mixing, and cooking is going to be processing. For the sake of this challenge, the “Kitchen Test” definition is used. I used bread as an example last year, so I’ll just do that here, too. Bread in its most basic form is flour and water. Yeast, sugar, and salt helps, too. When I bake bread at home, I use those ingredients. When the large bread factories bake bread, they add calcium propionate, high fructose corn syrup, calcium stearoyl lactylate, soy lecithin, and so on. These are not ingredients I could make in my kitchen without specialized chemistry lab equipment, so they don’t count as unprocessed. The most time-consuming part of this challenge, as I found out last year, is reading labels. Organic products can still be highly processed. The word “natural” on a label doesn’t even mean it’s natural, much less unprocessed. I really have to get into the ingredients list. One way around reading labels is just to cook from scratch. I’ve decided to bake my own bread this month, rather than search around for a bread with unprocessed ingredients at the grocery store. 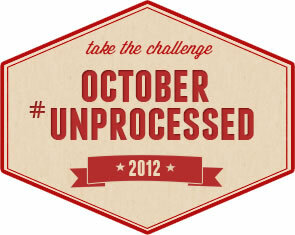 If you want to join the October Unprocessed challenge, you can sign up at Eating Rules. They have a lengthy FAQ and a downloadable Official Guide to October Unprocessed 2012. Or you could just follow along here. Several of us here and at sister site Vibrant Wellness Journal will be participating. I’ll be posting frequently about the challenges I find along the way. I can’t wait to see some homemade bread recipes; bread has always been a stumbling block for me, so I could use the inspiration! You go girl! This cause snuck up on me, but I was very conscious about what I ate today. I can’t say I was *completely* unprocessed, but I read the labels of (almost) all ingredients I used. I made quinoa and black bean stuffed peppers for dinner, which is relatively unprocessed for my family. Keep inspiring us please!